The first thing you need in your quest to lose weight and stay fit is a strong mind. You need to assess yourself and decide how much weight you need to lose. This should be based on your overall health, your height, age, and bone structure. Be realistic. Do not expect yourself to look like a supermodel after losing weight. Once you make the mental preparations, you can start the actual work. You really need to focus on your diet. When losing weight, many people feel that it is okay to eat what you want and then workout a lot. This is completely incorrect. The secret behind getting fit lies 80 percent in your diet, while the rest 20 percent lies in working out. 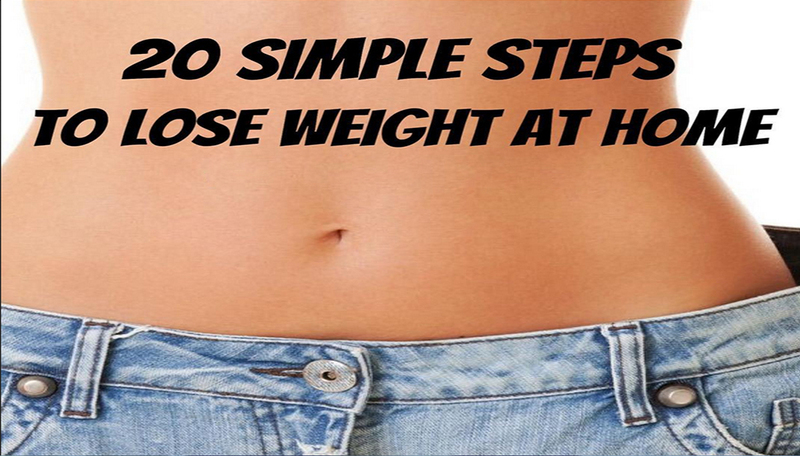 This is an integral part in losing weight at home and being able to sustain it. Making a note of what you are eating will help you assess your fitness requirements. For a week, eat in your normal manner and record what you eat. Write down everything in a daily journal. This will help you see how much you are indulging in extra or unhealthy eating. Once you start writing this down, go over the list and see what all you can avoid eating. The idea is to understand what you should continue to eat and what you should remove from your diet. Do not count calories or start measuring your spoons. Assess your normal meals and figure out where you are eating in excess. Can you cut the extra helping of rice? Or cut down the four biscuits with tea to two, or even reduce your sugar intake by a little? As with any quest, losing weight is a cumulative effort and the little things take you a long way. Get rid of fried or fatty food in your fridge. Replace the unhealthy food with healthier options. Substitute whole milk for 1.25% percent milk. Switch to tofu paneer instead of normal paneer when making a stir fry. When writing down what you are eating, be true to yourself. Do not make slight adjustments to make yourself feel like you are eating less. Even though it may be exhausting, ensure that you write down every little thing you eat, even the little tasting you do while cooking. Make sure that the portion sizes you write down are accurate. Be specific about how the food was made. Was it boiled, grilled, steamed, stir fried or fried? If so, how much oil did you use? Last, but not the least, stick to the food journal and make sure you take it everywhere you go. You need to jot down what you are eating, even when you eat out with friends! Drink lots of water to keep you full. Stock up on vegetables and fruits and fiber and nutrient-rich food to keep your cravings in check. The time when you eat is just as important as what you eat. It is better to eat small meals at an interval of 2 hours. This will help your sugar levels remain stable, thus keeping unnecessary cravings at bay. Try to log your food every two to three hours, and stay away from having large meals. Cut your normal, bigger meals into smaller portions and have them at the allowed frequency. A very sneaky trick is to serve food on smaller plates. If you place smaller portions on larger plates, you will feel that you are consuming lesser than what you need. But if you serve the same amount in a smaller plate, you will feel that what is placed in front of you is filling and satisfactory. When eating, try to make assorted vegetables the main dish, with lesser amount of meat, fish or dairy. Try a stir fry or a salad without unnecessary sauces or dressings. This will help you reduce adding any unhealthy food to your body. You can even have vegetables like cucumber, carrot and celery sticks as snacks. If you have a sweet tooth and crave desserts after dinner, substitute with cut fruits, a light drizzle of honey and a sprinkle of cinnamon.